Discover the Famous Elites Buried in England’s Westminster Abbey! 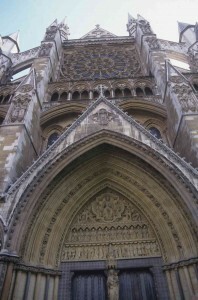 Make Westminster Abbey part of your adventure to London, England! As one of the most popular visitor attractions in London, Westminster Abbey brings thousands of curious wanderers every year. The famous Westminster Abbey Cathedral is an architectural masterpiece, towering over the graves, tombs, and memorials of the western world’s most influential individuals. From famous Kings and Queens to notable statesmen, practiced poets, and highly intellectual scientists, the vast modern marvel is brimming with British culture. As a widely recognized site for royal weddings, the setting for every coronation since 1066, and today, a place of regular worship and the celebration of England’s nationwide events, Westminster Abbey presents a unique spectacle of Great Britain’s past and present. Get acquainted with Great Britain’s highest regarded individuals as you weave through each lavishly adorned gravesite. In this week’s blog, we embark for London together and highlight the must-see tombs of England’s ancient legacies. In British culture it is a significant honor to be buried or commemorated in Westminster Abbey. In 1657 Oliver Cromwell, the Lord Protector of the Commonwealth of England, started the custom of burying elites here upon Admiral Robert Blake’s death. Fast forward to April 4, 1727, our very own Isaac Newton was buried when he died from kidney failure at the age of 84. Newton’s discovery of gravity and invention of calculus, which many modern astronauts use today to make space exploration tangible, it’s no wonder such a man’s final resting place is in Westminster Abbey. About a hundred years later on April 19, 1882, Charles Darwin, a man recognized for coining the evolutionary idea of natural selection and was buried in Westminster Abbey. Darwin reinvented our understanding of evolution by discovering that a species’ inherited genetic traits change, over hundreds of years, based on their environments .Both men revolutionized the way we see the world today and have two of the most visited grave sites in Westminster. Come see the famous graves for yourself and understand why so many science lovers have made the pilgrimage to Westminster Abbey. If you’re a poetry buff, an English major, or have a knack for creative writing, come see the respected grave of western culture’s most famous literary legacy, William Shakespeare. As one of the most well-known, prolific writers our world has ever seen, Shakespeare’s legacy is immensely influential. His words are used as common, idiomatic expressions in modern English. Shakespeare shared his final resting place with another literary legend, Charles Dickens. Dickens left his mark on our world with prose that drew attention to the hardships born from the social inequities of 19th century England. He helped stimulate social change which won the suffering lower classes freedom from what was, essentially, wage slavery. Westminster Abbey also houses many other influential poets and writers such as John Dryden, Lord Tennyson, Robert Browning, Samuel Johnson, Rudyard Kipling, John Milton, William Wordsworth, John Keats, Percy Shelley, and T.S. Elliot. See all your favorite authors and their final resting places and make Westminster Abbey a must-see attraction on your next trip. Explore Westminster Abbey And Visit London, England! This entry was posted on Wednesday, July 27th, 2016	at 3:14 pm	. You can follow any responses to this entry through the RSS 2.0	feed. Both comments and pings are currently closed.